At Bitcoin Gold, we are devoted to building an open and collaborative world. We believe a powerful cryptocurrency has to not only be fast and full-featured but also needs to be fundamentally secure and decentralized. These beliefs shape Bitcoin Gold’s unique roadmap. 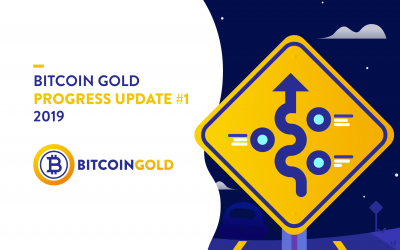 This page shows development progress and future plans for the Bitcoin Gold project. Items will be updated regularly as we provide bi-weekly progress reports to the community. Bitcore: infrastructure for building Bitcoin Gold and blockchain-based apps. BTG support added to bitcore-node, bitcore-lib, and bitcore-deb. A pre-requisite for Insight. Java implementation of the Bitcoin protocol from bitcoinj – crucial building block for developers of Java projects, like MyCelium wallet. ElectrumG is our port of Electrum wallet, with extensive features, full Bech32 (SegWit) support, HW wallets, etc. This lightweight SPV wallet relies on our free ElectrumX servers. Full LN tech preview on testnet includes port of lnd (LIghtning Network Daemon from Lightning Labs) for BTG, recksplorer (LN explorer ) and lseed (LN bootstrap DNS). Research conclusion: best approach is to deploy a Turing-complete contract language on Plasma sidechains on top of the BTG mainchain. Plasma for BTG will become a 2019 top project.